Thank you all for taking part of the 3rd annual Saylorville Dam Jam, it was again very successful regatta this year thanks to everyone for participating. This year we had 40 registered people for the event, a new record. I wanted to take a moment and send a thank you message to everyone who participated and who took their time to make time to make the event possible. All the volunteers who helped out, Barry, Laura Tofteland Chad and Diana Hutson, Jeff Hegwer, Jason Swanson , Michael Fox, Jeremy Meyer. For Barry and Laura a special thanks for providing boats and jet skis to making sure the event went smooth and safe and all their hard work that went into it. To the Flying Silos band for playing and entertaining for us Saturday night. To the Latitude 41 bar and Grille and crew for making our BBQ and hot breakfast for us Saturday night and Sunday morning. To Michael Fox and Jeff Hegwer for bringing regatta buoys and gear for the committee boat and helping doing RC so that I could participate in some races. To Chad and Diana Hutson and family for provding the most awesome RV as “headquarters” all three days and making sure we did not blow away during Saturday’s high winds. (the converted bus to RV made for a great wind barrier down at the regatta site. Also thanks to Chad for making lunch happening so smooth Saturday for all competitors. A 40 -50 burger grille that sits on a trailer is a nice to have for those kind of numbers. To Mike Howell for helping to go get stuff and making everything flow smoothly. To Randy Howell and Larry Reed for helping out with camping grounds and setting up guest campers for some of our competitors and helping pulling boats and Jet skis to and from the lake. I also wanted to take time to thank our sponsors for this year to make the event happen, without you guys it would be very difficult to pull something like this off without a huge cost for a few indiviuals, we thank you very much and hope you will continue to support us in the coming years. The main sponsors this year that helped out with prices and raffle stuff were WINDSURF DEAL , Northwest Mutual Financial (Jeff Byrn), Willham Orthodontics PC, and Latitude 41 Bar and Grille. Windsurf deal can be found at the following location www.windsurfdeal.com your one stop shop for any windsurfing gear on line. Quick and easy deals and part of the 3-phase team. They now also have taken on the AHD gear which can be found here. www.a-h-d.com Windsurf deal has been a 3 year sponsor for the Saylorville Dam Jam and provided the raffle sails we drew the two lucky winners for Saturday night during the BBQ and live muisc at the Latitude 41 bar and grille (Steve Callaway and Diana Hutson were the lucky winners this year) . Make sure you check out these sites and if you have questions on the KA-Sails dont hesitate to contact them since they are experts on it. There are also several KA sail riders in our area that can help you with gear selection and feedback. Thanks again Jurg and the team there for supporting us. Arden and myself will put together a more in detail regatta report and update on the www.mowind.org website in the next few days. Thanks again for participating this year, feel free to forward this to anyone I might have missed. First of all, thanks to Uffe and his entire crew for setting up a tremendous event. A lot of people put time into making the event great, and it showed. Best of all – there was WIND! We also had international attendance with Uffe coming from Sweden, and Woody and the gang coming down from Canada. Winds were already over 20-mph on arrival to the site Friday evening, and built to quite a bit more as the night progressed. Uffe and I had an interesting time making sure the race committee boats (pontoon and two jet skis) stayed secure overnight, as both the pontoon boat and the jet skis were at risk of being washed away by the increasing winds from their beached positions. After some on-the-fly adjustments, around midnight in 30+ mph winds, we got things secured and were ready for race day. 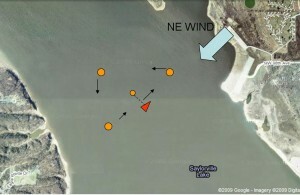 We woke to more 30+ mph winds on Saturday as registration was completed and people contemplated what to rig. Plenty of sailors had already been out on sails in the 5 – 7 meter range, and I decided to rig a 7.8 and put it on a 125L board to see how that would handle the figure-8 slalom course that was being set. My first runs across the lake (also my first runs of the year) were wild but I decided that I could handle it and wanted to make sure I was powered up for the races, especially since it was a bit light on the inside (still 15-20 though). One twist to the figure-8 course was that it would be a beach start rather than a flying start. So, we needed to start in waist deep water (inside mark-A) and launch ourselves as the start horn went off. We had to complete three laps out to mark-B before finishing between the onshore flag and mark-A. 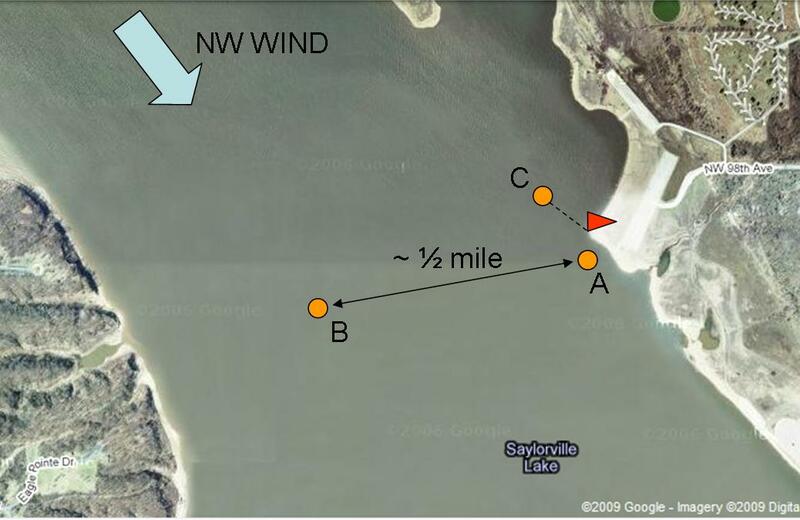 It was about a half mile beteen the buoys, so we needed to cover about 3-miles each race. NOTE: Mark-C wasn’t used until the afternoon session. My gamble to go with a big sail paid off immediately as many people struggled to get away from shore as the first start coincided with one of the biggest lulls we had seen that morning. I managed to lead the race start to finish with Steve Johnson and Robin Shaw battling for 2nd and 3rd position. Adam Anderson and Peter Hartwitch (on an IMCO!) rounded out the top 5. Race 2 again had some holes on the inside and I was able to keep up a full plane throughout the race, finishing in about 10 minutes. Although some of the gusts were quite high (Adam broke his booms hankering down in one of them), most of the fleet struggled to stay planing in the lulls. So, my advice to racers out there is that “Races are won in the lulls, not in the gusts,” so you should rig accordingly. After another finish with Steve Johnson in 2nd and Robin Shaw in 3rd, Robin decided to heed that adage and went up a sail size for Race 3. Guess what? In Race 3 Robin ended up battling me all the way around the course with the extra power he got from the bigger rig, and took win. I finished in 2nd place as we blazed across the line within a few feet of each other. Steve Johnson finished 3rd, with Don Altmyer in 4th and Peter sailing consistently to another 5th. We headed in for a quick break and lunch provided at the race site by the great oganizers. Meanwhile, the Sport Fleet also had a battle going on between Morgot Woodworth with a first and two seconds and Gregg Anhaus with two firsts and one DNF. After lunch the wind seemed to have backed off a little bit and most people took out slightly larger gear. Also, afternoon races were going to be with flying starts utilizing Mark-C and the same onshore flag. I stuck with my same combination from the morning and found that I still was able to plane sooner than most of the fleet and took another first place. Robin, Steve, Don, and Adam rounded out the top five. In sport fleet, Steve’s wife, Kelly, got herself rigged and ready to go by taking first place in front of Gregg and Margot. Race 5 probably had some of the biggest lulls and strongest puffs of the day. I got away quickly from the start line and did well for a couple of laps until Robin caught fire and reeled me in during a large puff. For the next three reaches we sailed close to each other as he would pull ahead in the gusts while I prayed for the wind to die down some so that I could take advantage. On the final leg I got the lull I was hoping for and passed Robin in the last 100-200 feet to get another bullet. Steve, Adam, and Peter rounded out the top five. In the Sport Fleet, Kelly won again followed by Gregg and Margot. Race 6 had some fluky wind at the start and I seemed to be the only person to get off the line and rode a puff all the way to the outside as the rest of the fleet sat in a wind swirl. I met most of the sailors about 1/2 back and thought I had the race in the bag. Well, another lap later, young Josh Woodworth was in fast pursuit and I was glad I had such a buffer from early in the race. He reeled me in quickly on the final leg, but I had enough lead built up that I managed to limp home barely on plane for another first, with Josh finishing in a close second. Robin, Ulf (after getting back on the water from his RC duties), and Steve made up the rest of the top five. Kelly won the Sport Fleet again with Gregg in second and Igor Tereshchenko (our great photographer from the Walleye Wagatta) made a good effort for third place. After Race 6, we packed up our gear, licked our wounds, and headed to Latitude 41 for some good eats and entertainment. Several prizes were auctioned off and a lot of good times were going on both at Lat-41 and at the camp site. It’s a good thing we got in so much racing on Saturday, because Sunday came with glassy water and overcast skies. Fortunately by 10:30 or 11:00 we started to see some promise in the wind so we quickly rigged and set to sailing a triangle course in 3-8 mph winds. Peter sailed a great upwind leg to lead the race early, followed around the top mark by me Robin, Don, and Adam. I took advantage of my larger 10.0 m^2 sail and DivII board to get past Peter on his IMCO on the reaching legs and held onto the lead for a first place finish. Peter jockeyed Robin, Don, and Adam around the rest of the course and even lost some position to Robin before pumping his way back into 2nd place within feet of the finish line. That left Robin (also sailing a 7.5 sail) in third with Adam and Don rounding out the top 5. “Low Boom” Larry Reed made his first racing appearance of the weekend and sailed into first place in the Sport Fleet, followed by Igor and Margot. Niels Zaunmueller finished first in the Sport Junior Fleet. Another sequence was started, but there was a general recall from so many people pushing the line at the start…it was good to see everyone jockeying for position on the line. After the restart, a handful of people made it around the top mark as the winds died, and the race was abandoned. This ended up being fortunate as the wind faded down to nothing and rain started as we were de-rigging. We ended the weekend with seven solid races, six of which were in outstanding conditions. The final A-Fleet Results had me in 1st, Robin Shaw 2nd, Steve Johnson 3rd, Peter Hartwitch 4th, and Don Altmyer 5th. Robin Shaw made his impressive finish on limited-division equipment, and 2nd place in limited went to Josh Woodworth, with 3rd place in limited division going to another young gun, Magnus Zaunmueller. In the Sport Fleet, Margot Woodworth won with her consistent finishes, followed by Gregg Anhaus in 2nd, and Kelly Johnson in 3rd. Niels Zaunmueller won the Sport Junior Division. 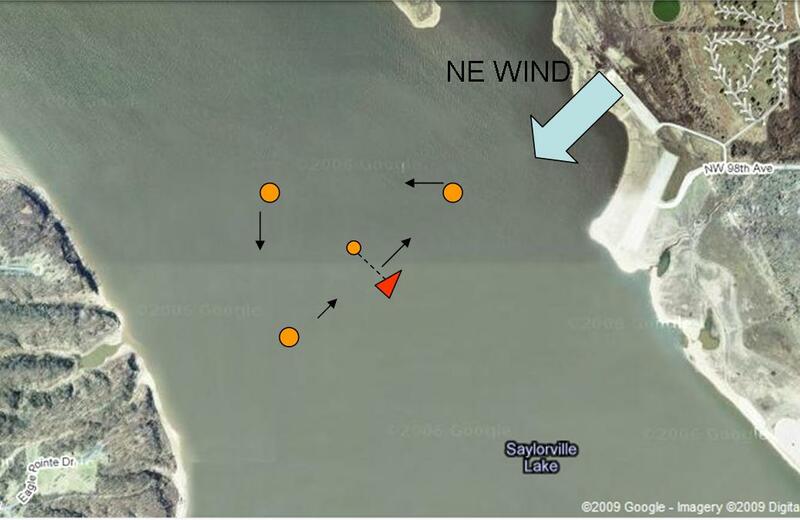 The next two races in the MOWIND Race Series are both part of the US Windsurfing National Race Tour. The Toledo Championships are May 30-31, and the Worthington Windsurfing Fesitval is June 12-14.